Many of the same elements required for success in sports mirror what is needed to achieve a world of peace and justice. 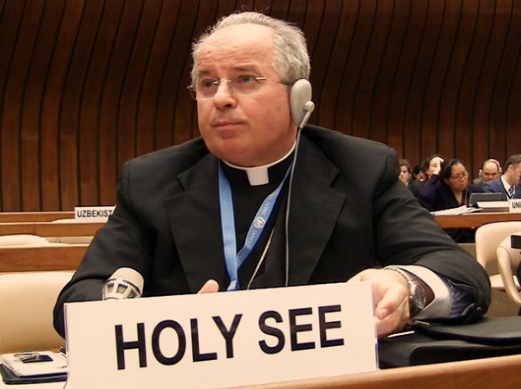 This was the message November 28, 2017, from Archbishop Ivan Jurkovič, Permanent Observer of the Holy See to the United Nations and Other International Organizations in Geneva at the SIGA (Sport Integrity Global Alliance) Special Session Geneva, in Geneva. “In our day, we seem to place much more emphasis on the final outcome of our efforts rather than on the journey to reach our goals,” Archbishop Jurkovic said. “Most people seem to give more value to the goals in themselves with little attention to the important and essential steps indispensable to achieve them. In our day, we seem to place much more emphasis on the final outcome of our efforts rather than on the journey to reach our goals. Most people seem to give more value to the goals in themselves with little attention to the important and essential steps indispensable to achieve them. Nevertheless, most of us understand that reaching an objective requires training, practice, hard work, and much determination and dedication. We are gathered today at the Palais des Nations, where these same elements are necessary for the realization of peace and where the journey to obtain relevant international outcomes can genuinely motivate us to respect the perseverance and loyalty of each partner in international dialogue and negotiations since the journey can create spaces for friendship, sharing and solidarity. These same characteristics inspire sporting activities. As a matter of fact, since ancient times, sport has been seen as a way to help the human person to mature and develop, since it has the potential to moderate human instinct and the capacity to gather people together towards a common goal, promoting integration, solidarity, and peace. Furthermore, sports have universal appeal and the ability draw people from diverse cultures and backgrounds together in friendly competition. Thus, sport has the potential of helping overcome individualism and selfishness, leaving space for the logic of brotherhood and unity, the only elements capable of authentically promoting the common good, at all levels. In this regard, the Catholic Church has always regarded sports as an expression of the human person’s entire being and recognizes that sporting activity is linked to education, the formation of the person, to relationships between people and integration, and, finally, to spirituality and integrity. Today, I would like to reflect with you on three elements through which sports can really contribute to peace and development. Sport as a tool for the integral human development. The Church’s teaching regarding sporting activity is above all systematically centered on its educational potential and it finds in it a means for the integral development of the person. In this regard, the Church has often used the metaphor of sportsmanship as an image of maturation – both corporally and spiritually – thus recognizing the role that sports can play in perfecting the human person. As Pope Francis said in his message for the FIFA World Cup, “In this practice of sports, we can see a metaphor for life. In life it is necessary ‘to train’, to strive to achieve important results. The spirit of sports becomes an image for the necessary sacrifices in order to grow in the virtues that are necessary for the character of a person. For a person to improve, extensive and consistent ‘training’ is necessary, and much more is needed to achieve an encounter and peace between ‘improved’ people! It’s necessary ‘to train’ a lot…”1. When athletes prepare themselves for a race or a match, the methodical workout develops their talents and helps them to overcome personal challenges, learn discipline and a sense of sacrifice. All this creates the pathway for authentic human development since it requires sacrifice, tenacity, patience, and, above all, humility, which does not receive applause from the public, but which is the real secret of victory. In this context, it is important to underline that the Church has always been interested in issues related to sports because she prizes everything that contributes constructively to the harmonious and complete development of the human person, body, and soul. In schools and youth clubs, the Church attaches great value to sports education, which is a training ground of virtue, a school of inner balance and outer control, an introduction to more true and lasting conquests. As a matter of fact, athletic activities – when practiced in the proper manner – can develop strength, proficiency, perseverance, and harmony, while, at the same time, favoring interior growth, becoming a school of loyalty, courage, endurance, tenacity, and fraternity. Sport, therefore, represents a concrete way to an integral human development, which represents a first and necessary step towards the realization of a peaceful world. Sport, integration and international solidarity. There is another aspect of sports which helps to guide our actions, namely, belonging to a team requires the individual to overcome every form of selfishness and isolation, since teamwork offers the opportunity to meet and be with others, to help each other, to compete with mutual esteem, and to grow in fraternity. When the athletic spirit succeeds in overcoming selfishness, each member of the team offers his or her contributions, no matter how great or small, to the overall harmony and success of the group. In the long run, teamwork is much more successful than the exaltation of any one single player. Sport, therefore, constitutes a tool to educate people to the importance of sharing, friendship and respecting others, as of the immense value of solidarity. The United Nations has developed a new strategy to promote Global Human Rights, through the implementation of athletic programs that sponsor peacemaking initiatives, tolerance, and reconciliation, through the education of decreasing tensions, inequity and prejudice2. There is increasing recognition, on the global level, of the efficacy of humanitarian programs that employ sports as one of their tools for development in geopolitical and cultural contexts. Very Recently Pope Francis acknowledged that sports provide a “universal language” and have the potential to “overcome cultural, social, religious and physical differences, and … can unite people, making them participants in the same game and, together, protagonists of victory and defeat”3. Since 1996, the International Olympic Committee (IOC) and the United Nations High Commissioner for Refugees (UNHCR) have worked together on sports projects for refugee camps and resettlement areas worldwide. Basic sports equipment and recreational activities are offered to refugee populations, who are continuously deprived of essential goods, and are particularly in need of leisure activities to overcome the idleness of their life in a camp, especially among children and the young. In this regard, sports activities are also the way to facilitate dialogue between refugees and local communities surrounding the camps, creating a space of sharing and meeting. In fact, dialogue and encounter through sport hold great potential in the area of peacebuilding and conflict prevention. While the rule of law and justice remain the foundation of durable peace, sports provide the tool for factions locked in conflict to come together for a common purpose. These moments of unity may be brief and, at times, fleeting, nonetheless they provide an important reminder that, in human experience, there are many more things that bind us together than those that tear us apart. During the Rio 2016 Olympic Games, there was, for the first time, the participation of a team of refugees. Ten young men and women who fled their countries in search of protection, who had no safe citizenship in their homeland, nor in those they were welcomed to, found a common origin bond in sports. Their participation in these Games made us rediscover the original value of this event since it enjoys an honored tradition of promoting peaceful international relations among diverse peoples. Overcoming economic interests and selfishness. The shared values of sports, however, are not generated in isolation. Our common commitment should be their protection from an increasingly materialistic culture, which also has produced inequalities worldwide, leading 767 million people4 to live in conditions of extreme poverty. Since “in sport, as in life, competing for the result is important, but playing well and fairly is even more important!”5, the real challenge before us is, therefore, to maintain the honesty of sport. It is thus of utmost importance to overcome economic interests and the logic of individualism, in order to promote the integrity of sport. And This is exactly what your association, the Sport Integrity Global Alliance (SIGA) does, since it has the aim to “promote the highest standards of fair play in the administration of sport, particularly in the areas of good governance, financial integrity, and sports betting integrity”6. In conclusion, dear friends, The International Community should look at your commitment. We, in turn, should maintain our commitment to ensure that sports and global matters should be always more inclusive and fairly managed. As a matter of fact, the Church attributes great value to sports-related ties, provided they do not lead the individual person or country to become too presumptuous. On the contrary, sports should make players become attentive to the interests of other and lead them to a sense of brotherhood and honesty, which contribute to building a civil society where competition replaces antagonism, where agreement replaces conflict, and where loyal confrontation replaces rancorous opposition. Thank you. 1 Pope Francis, Video message for FIFA World Cup 2014. Translation in L’Osservatore Romano, 12 20 June 2014. 2 Giulianotti, R. (2011). Sport, peacemaking and conflict resolution: A contextual analysis and modeling of a sport development and peace sector. Ethnic and Racial Studies, 34(2), 207-228. 3 Pope Francis, Address to the Special Olympics Athletes Participating in the Unified Football Tournament, 13 October 2017. 4 Cf., World Bank Open Data, http://www.worldbank.org/en/understanding-poverty. 5 Pope Francis, Address to participants in the “Sport and Faith” conference: ensure sport is inclusive and its benefits are accessible to all. 05 October 2016. 6 Sport Integrity Global Alliance (SIGA), Statement of Intent, http://siga-sport.net/statement-of-intent/.